June 25-29, 6:00-8:30, Liberty Baptist Church, age 3 - 6th Grade, "Game On", snacks provided. Thank you! Thank you! I have added it to the list. 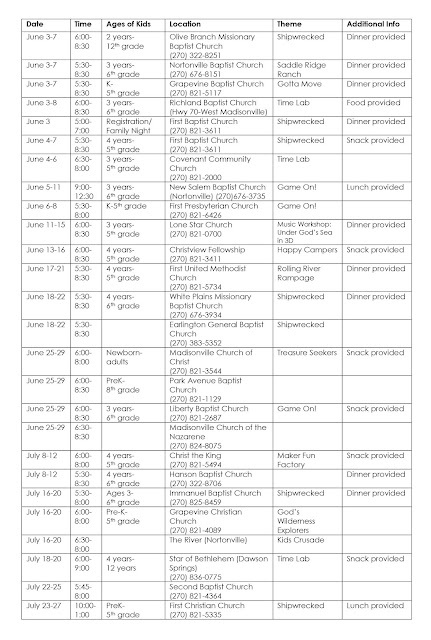 Christ the King is in July instead just went to signup and found that out. love the page. Thank you for letting me know! I have updated it. Thank you! I have added it. Thank you - I will add it! Do you have any idea of ages of children included?